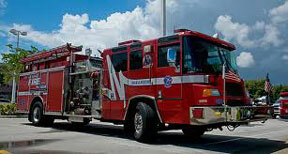 Fort Lauderdale Fire Rescue responded to an apartment fire at 1115 SW 15 Terrace Sunday afternoon. Upon arrival crews encountered heavy smoke and fire from the first floor apartment. Two elderly victims were trapped on the second floor and had to be rescued by firefighters that carried them down to safety. The fire was quickly extinguished by Fort Lauderdale Fire Rescue and contained to the apartment of origin. One 17 year old was transported to the hospital with minor injuries.